Pamela Golden’s miniature paintings operate like keyholes, offering voyeuristic access to an imaginary world. She coaxes the viewer into looking intently at tiny, narrative details. The charming effect is accentuated by the use of much larger frames leading the eye gently into a constructed microcosm. In her new show, Golden continues to exhibit these entrancing works, which resemble small, prints from an old-fashioned ‘contact’ sheet. 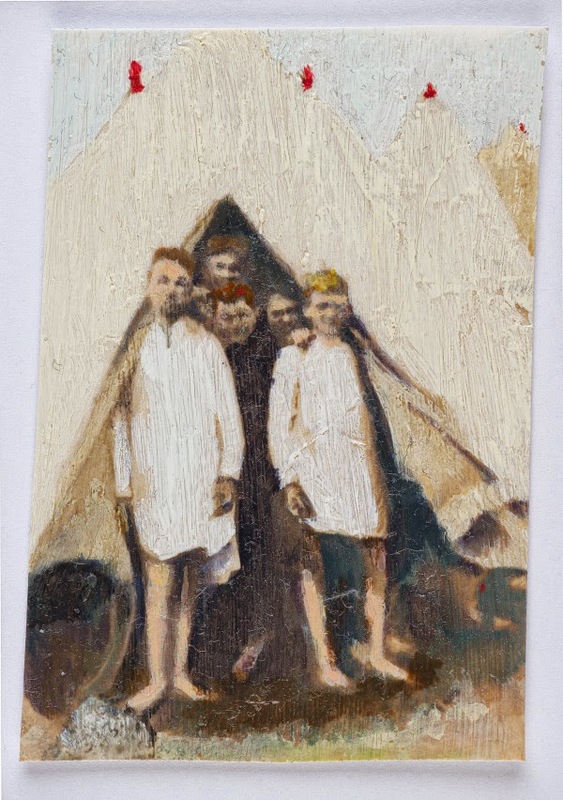 This method is appropriate because these paintings originate out of found photographs commemorating a choir visiting a North Wales seaside resort c. 1912. In ‘Good Morning, Mr Williams’ schoolboys pose in the mouth of a tent, waking up for the new day. Tiny details such as the red poles poking up out of the canvas animate this jaunty Edwardian scene. Recently adopting an entirely new method, Golden also exhibits five larger paintings using the same photographic source material. They are made with the difficult Sumi watercolour process, requiring the application of a textured pigment much like gold leaf. ‘A Flash Of…’ illustrates faint figures walking through wild flowers in a meadow, in delicate almost forgotten shades of green and yellow. Reaching back across history, Golden, superimposes the old photographs onto her own observation of the same landscape. This achieves a poignant layering of time and place, scrambling photographic and topographical certainties. Led back across a century to a summer spent by the sea, these paintings address nostalgia for childhood and an elegiac interest in anonymous characters long passed out of memory. The only regret is that the lighting within the gallery rather washes out these remarkable images, but the more enduring effect is the impressive encounter between the estranging impact of time and the universal experience of youth. Accompanying the exhibition is a soundtrack featuring the singer, Roshi Nasehi, and music ranging from Led Zeppelin to Persian nursery rhymes, which reasserts the hybrid roots of the entire project.